INSPIRE is a web-based project management and single source communication hub that optimizes the collaborative participation of your creative team, account managers, vendors and clients. INSPIRE is an environment in which creative development, task management, resource scheduling, and multi-level approvals may be monitored and managed 24/7... by anyone... from anywhere... for any number of creative projects... in any medium... simultaneously. The Message Server Communication Suite is designed to take care of your communication needs. It allows you to send messages to pagers,mobile phones (SMS), fax machines, as voice file or as E-mail. At the same time you can configure the application to handle all your incoming calls. 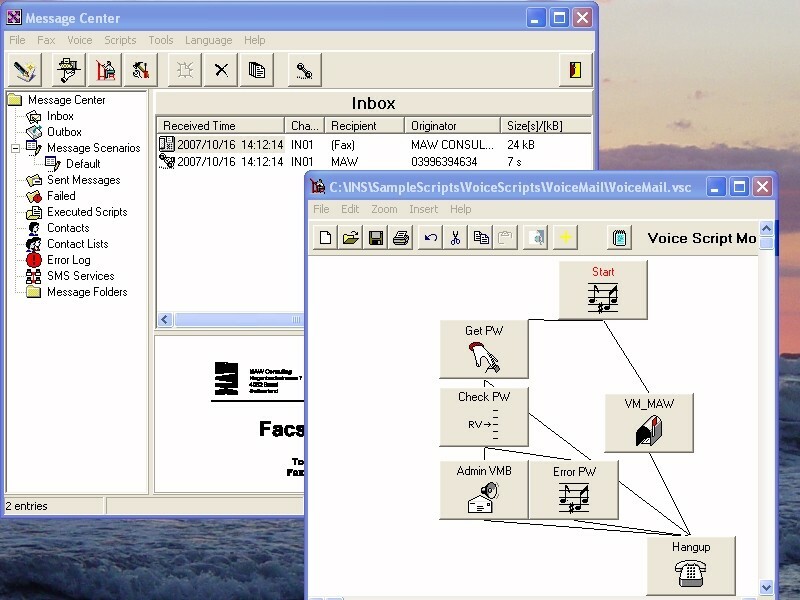 Interactive Voice Response (IVR) applications for CT, where the caller uses the phone keypad to enter values, can be created through the graphical script designer. ProjectForum is software that makes it easy for a team of people to work together. Whether your team members are across the room or across the globe, ProjectForum lets you share ideas, documents, schedules and status. Share and discuss your work online, privately and securely. ProjectForum is wiki server software that is entirely self-contained and hassle-free to install and use. No messing around with databases, CGI scripts, web servers, config files and the like. In fact, no dependencies on any other software. Data Messenger Server (DMS) is an alert notification server that monitors an existing database while running on Microsoft’s operating system platforms. Notifications can be sent to wireless enabled devices, cellular phones, alphanumeric pagers, and desktop computers throught Microsoft's Exchange or native SMTP support. DMS is neither a gateway nor an Application Programming Interface (API), it is an independent server application. DMS can be used for most notification purposes; send notifications when an order is placed, send a dispatch notification upon entry into a database, send an escalation notification when an issue has not been resolved within a prescribed period of time, push a web page data collection form to a browser enabled device. Colligo Workgroup Edition software enables any wireless (WiFi) capable laptop, desktop or tablet PC to instantly and securely network to one or more computers, no matter where you are. At the coffee shop, at home, at the office, at a customer/vendor, at the park, create an instant wireless (ad-hoc) network with one click. Once you have the connection, Colligo Workgroup provides you with applications that enable you to share files, share an Internet connection, share a printer, collaborate on a document, chat, schedule meetings in Outlook and much more. Infowit - Creative Manager is a web-based project management software solution that allows clients, vendors, and agencies to communicate and collaborate on projects in real-time 24 hours a day. Estimating, Integrated Scheduling, Time Cards, Tracking, Client Review and Approvals, Asset Management, Contact Management and Prospecting, Procurement, Purchasing, Financials, and more! Sonork is an Instant Messaging System for private networks. Allows companies to use the IM technology for internal communication, create and control their own Instant Messaging System. Feature include central administration, flexible configuration, drag & drop environment, support for web applications, integrated http engine, integrated file server, support for socks/nat, login and message logging. Share contacts, appointment calendars, and task lists among workstations in real-time without requiring Exchange server or other expensive server software alternatives. Users can print mailing address labels, calendars, address books, connect with email, fax and web applications, mail-merge with Word and WordPerfect and much more. Also available (included with site license) is synchronize support for Palm and Pocket PC devices, including the ability to synchronize multiple PDA's with the same shared databases.